Their faces said it all. One child was upset they had “suffered through” 30 minutes of boredom, and the other was crying that they had to leave Daddy. We sat in the car, cuddling and talking for at least 5 minutes before we could even pull out of the parking lot. There were moans of hunger, cries of “I never get to be in charge!”, complaints about breakfast, and lamentations concerning their early wake-up call. I was still feeling great from my meeting that morning, so it was their lucky day. I was sweet, caring, and patient with their formable hearts. I listened and patted backs. I reminded them of their blessings and how we don’t need to complain. I basically owned parenting for that short 5 minutes. Who is the best mom ever? This girl. With everyone calm, we buckled up and traveled the mile back home. When we arrived, I let my son finish watching the last of his movie from a few days earlier. I joined him for a moment to interject about a particular scene in the movie and gave him a hug. Moving on, I walked past my daughter laying on her bed, sucking her thumb, watching a cartoon on my phone. I kissed her on the forehead and asked what she would like to eat for lunch. She removed her thumb only long enough to answer me then snuggled deeper into the blankets. I made my way to the kitchen, feeling… content. Peaceful. Light. Settled in my spirit. Immediately I broke into tears. On a typical day, I feel guilt. Constant, nagging, unwavering Mom Guilt. Maybe you feel it too, this constant tug of inadequacy. I feel I am never patient enough; never strict enough. I can’t keep their rooms clean (that’s a mom’s job, right?). I let them watch too much television. I don’t engage enough. Let’s call it what it is: Mom Guilt. Mom Guilt is playing tag with someone you cannot catch: You get sweaty, frustrated, and no one wins. Mom Guilt is playing tag with someone u cannot catch: U get sweaty, frustrated, and no one wins. But today? Oh, today these were good tears. In a split second, God revealed I didn’t feel bad for my kids watching television! I wasn’t questioning my choice. I wasn’t comparing my parenting to anyone else’s. I felt free and affirmed in my parenting choice. Instinctually I knew both kids were 1.) tired, 2.) hungry, 3.) needed time to themselves. I let them each take their own course of action to achieve what they needed at that moment and I didn’t feel one ounce of Mom Guilt. You know why? Because for that moment, amid the real-life complexity of being a mom, I let God lead instead of my fear. Did you know guilt is the result of fear in a person’s heart? I fear ruining their developing brains with technology, so I feel guilty when they play a video game. I fear becoming a lazy mom, so I feel guilty when I lay on the couch to read a book instead of playing. I fear teaching the kids my own bad habits, so I constantly second-guess my own choices. I fear letting go of my littles who are becoming not-so-little, so I feel guilty when I don’t soak up every moment I am with them. Maybe you are like me, letting fear be in charge and guilt make decisions for you. Did you wake up this morning with grand plans, but the enemy dashed them to pieces with fear and guilt? When was the last time you felt light as a mom? When did you last pat yourself on the back for a job well done? Has it been too long? I couldn’t remember a time when I didn’t feel the heaviness I carry. The fear and guilt partnership began the moment I got pregnant and did not stop until I put my foot down. 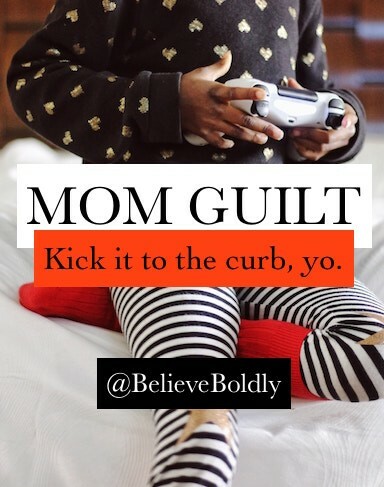 How can you kick Mom Guilt to the curb, once and for all? 1.) Remove fear from your heart and home. After I thanked God for helping me recognize what healthy parenting felt like, I followed it by kicking the enemy in the teeth. I had allowed fear, which is not of God, to choose how I parent. No longer! I prayed again over my home, that fear was no longer welcome. I asked God for His perfect love, which casts out fear, to come into my home and continue to guide me. 2.) Listen to the needs of your family. Technology isn’t bad. Sweet treats before lunch aren’t bad. A messy home isn’t bad. It is the abuse of these that is bad. Little people need breaks, too. They have rough days and sleepless nights. They may need a solid 5 minutes of cuddling in the car before you drive home or a conversation over a cupcake at 10 a.m. If we listen to the needs of our family, we can better serve their hearts guilt-free. You are well equipped to be a mother. Yes, you! Stop looking to the right and the left for the latest methods or techniques. Stop pinning like a maniac and engage with your own smelly, silly, p.j.’s-in-public ragamuffins! These precious personalities are meant to be unique and as a result, so must your parenting style. This isn’t one size fits all, so let go of what Suzie so-and-so is doing down the street. Her kids are probably just as weird as yours, anyway! When we let God lead, our guilt leaves! I am thankful God gave me eyes to see motherhood the way He sees it: as a gift. Nothing to prove and not a burden to bear, but a chance to draw closer to God in my identity as Mom. I needed this today. Especially when I caught up Kaeden in my arms to snuggle him only to step on a lego car ($ouch! @#) & fall. I feel a little anxious when things aren’t going “right” but this helped…. Now it’s nap time. Time to reset. wow, I never fully connected guilt and fear before–but it is so true! So much of our guilt comes from our fears of not being or doing enough. Thanks for this, I will be thinking on this one. Great insight linking guilt with fear—so true! I hadn’t thought of it that way before. Thanks!